Save $5 when you buy the 4-pattern set. These realistic faux trophy mount sculptures are fun to make with card stock, paper mache and paint. Display them on your own wall, or create four unique gifts that will be treasured for years. 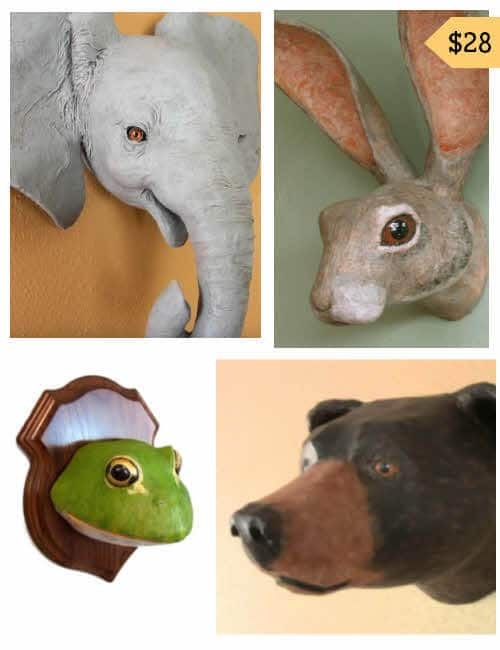 Included are four printable patterns for: a Life-sized Baby African Elephant, a Jackrabbit, a Giant African Bullfrog, and a Black Bear. If you’re new to building paper mache sculptures with papercraft patterns, start with the silly green bullfrog. After that, the other three sculptures will be easy! Make them for your own walls, or create four wonderful gifts for your animal-loving family and friends. Just print the downloadable patterns on card stock, cut them out, and tape them together, using the numbered tabs. The patterns create all the shapes for you. Just covr them with paper mache or paper mache clay, and paint. Wanting to know the clay that you used for you animals. Hi Sandy. I use my original paper mache clay recipe, but I add less flour so I can spread it very thinly. It dries very hard and strong, so a thin layer is all you need.